Following an arranged marriage to a penniless manga artist, Nunoe struggles to remain positive faced with debt and contending with their frugal lifestyle. Meanwhile, her husband, seemingly permanently upbeat artist Shigeru, continues undeterred with his comic, which, with it’s creepy grotesque subject, is not popular in post-war Japan. Based on a true story and following a successful drama series of the same name, the film looks at the years leading to Shigeru Mizuki’s incredible success with Kodansha publishing “Kitaro”. An unconventional film in that the relationship between Shigeru and his wife is told without the usual romanticised writing. Their hardships are not overplayed, but you sense their struggling in a couple of emotional scenes. Similarly, Shigeru’s trauma, he lost an arm in the war, and his wife’s impatience with their lack of money are stolidly ignored by the characters for the most part. The film ends somewhat abruptly, as Shigeru Mizuki’s comic series success and following career are well-documented elsewhere, however those knowing little about his life may feel the film lacks a satisfactory resolution. The film employs a number of novel animatics, flashback sequences and other unusual effects to portray an imagination at work. These flashes of inspiration were an interesting way to show the creative process at work. Interesting camera work at points also showed the couple’s askew image of the world. 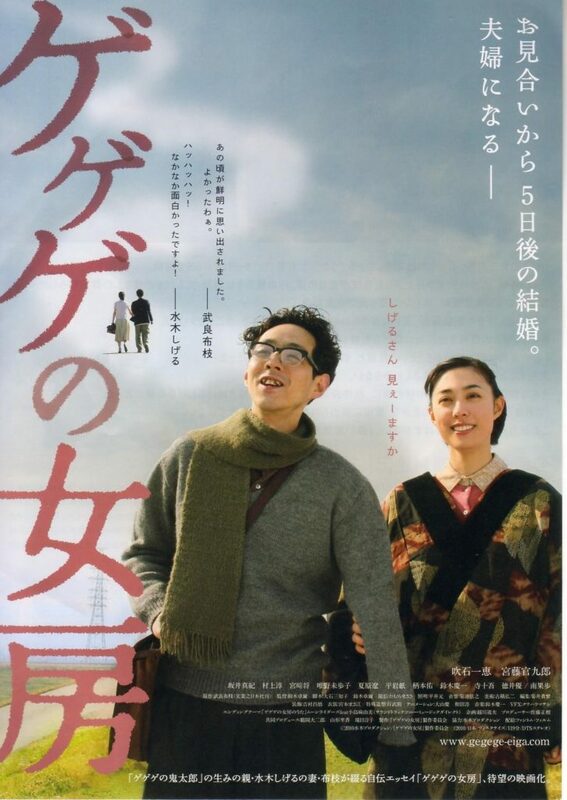 For the most part the film follows Nunoe and Mizuki, and the film paints a subtle and detailed picture of their life together. Their story is inspirational and for those with an interest in Mizuki Shigeru, this film may be of interest as it is a solid dramatization of his married life.